Who is Moscow backing to be the next UN Secretary-General? In response to a question whether Russia would veto a candidate not from Eastern Europe, Churkin said that Russia is not going to do that, though he quipped that he loves to veto. U.N. High Commissioner for Refugees Antonio Guterres arrives to speak during a news conference in Istanbul, Turkey, on June 18, 2015. On October 5 the United Nations Security Council held another "straw poll" of candidates for the post of the next UN secretary-general, with Antonio Guterres, a former prime minister of Portugal, emerging as the favorite. Russian experts believe that Moscow is ready to work with him. The powers of incumbent UN secretary general Ban Ki-moon are to expire on Dec. 31, 2016 and the organization must choose a new secretary general before that day. The Security Council is holding a series of straw polls to select Ki-moon’s replacement – the sixth took place on Oct. 5. 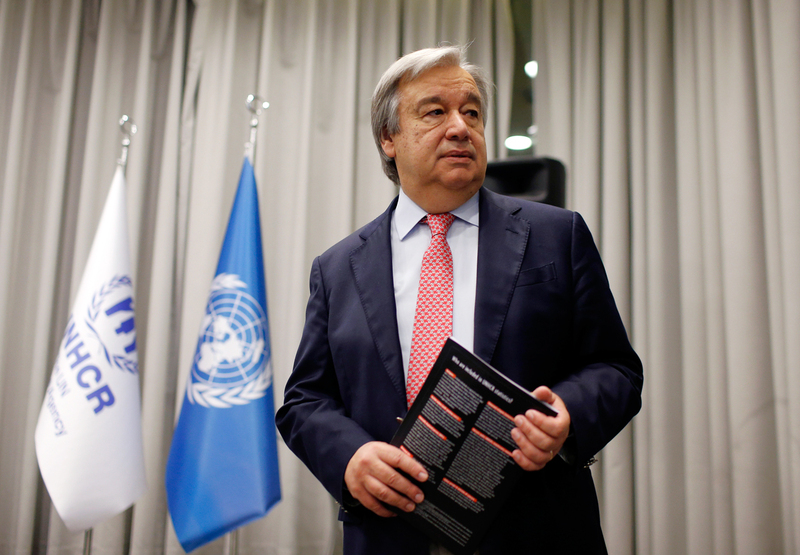 Like the previous five, it was won by former Portuguese prime minister Guterres, who served as the UN High Commissioner for Refugees from 2005 to 2015. The next Security Council meeting, to be held on Oct. 6, is mostly a formality. Russia's permanent representative to the UN Vitaly Churkin called Guterres "a clear favorite," and has already wished him "every success in the performance of his duties," reports (in Russian) Russian business daily Kommersant. The likely victory of the Portuguese in the fight for the seat of secretary general goes against the expectations of many diplomats, who believed that the next general secretary would be a woman and/or a representative of Eastern Europe (neither women nor Eastern Europeans have previously occupied this post). Ban Ki-moon, in particular, said that he would like to see a woman as his successor, according to (in Russian) the TASS news agency. The same was said by Churkin, who also stressed that "it is the turn of Eastern Europe." However, Guterres should not fear that Russia, as a permanent member of the Security Council with veto power, will block his candidacy. In July, in response to a question whether Russia would veto a candidate not from Eastern Europe, Churkin said that Russia is not going to do that, though he quipped (in Russian) that he loves to veto. Fyodor Lukyanov, editor-in-chief of the Russia in Global Affairs magazine, said Guterres suits Russia fine, as well as other UN "heavyweights." Political analysts believe that the secretary general, whoever fills the post, is an administrative figure, despite the high status; political trends in the United Nations are set by permanent Security Council member countries. Nevertheless, the UN members are approaching the choice of secretary general with care and consideration in order to prevent the excessive concentration of influence in the hands of one of the leading powers. For this reason, the representatives of the Security Council permanent members have never stood for election to the post during the 70-year history of the UN. “The secretary general is always a compromise figure,” said Timofei Bordachyov, director of the Center of European and International Studies at the Higher School of Economics in Moscow. According to Bordachyov, the key states ensure that candidates for the post of general secretary do not express the interests of their competitors. This guarantees balance. Bordachyov is confident that Russia will be able to pursue its interests at the UN, regardless of who sits in the chair of general secretary. "Russia's position is self-evident and is not related to specific candidates for Ban Ki-moon's post," he said. "I do not think that Russia has any serious stakes in this matter." Lukyanov is in agreement. "If a candidate does not suit any of the ‘big five,’ they are blocked – and that's all," he said. "As a result, all those who managed to stand in the vote are equally acceptable to everybody." For this reason, he explained, there was no significant difference for Russia between the remaining candidates for the post of secretary general. Earlier, media sources such as the Gazeta.ru online newspaper had suggested (in Russian) that Moscow was still more sympathetic to Bulgarian Irina Bokova, director-general of UNESCO, than any other candidate. Bokova, the daughter of a member of the Central Committee of the Communist Party of Bulgaria, is seen in her country and in the West as a pro-Russian politician. Kommersant cited (in Russian) Ilian Vassilev, former ambassador of Bulgaria in Russia, who pointed out to Bokova's "demonstrative closeness" to the Kremlin. Bulgaria nominated Bokova as a UN General Secretary candidate in February 2016, but at the end of September suddenly decided to put up another candidate – the European Commission's vice-president Kristalina Georgieva. Lukyanov believes that Bulgaria gave up supporting Bokova not because of her proximity to Russia but because it wanted to promote Georgieva, a representative of the European institutions. According to the analyst, the replacement of a candidate at the last moment badly affected the prospects of both the representatives of Bulgaria, and as a result both women lost.